with Tastiest Startup Award from Virgin. Killer Tomato is a product launched at a popup store in London. It changes the perception that vegetarian food must be bland. The startup was founded by Matt Paice (full disclosure: he is a nephew). His meat-free Mexican food is said to "pack a punch". He scooped up the Tastiest Startup award from Virgin Startup for his Killer Tomato street food startup. In New York City, Brooklyn is thought of as the culinary innovation epicenter. The best new restaurants are heavily concentrated there. Food startups in the United States attracted $350 million in 2012 according to CB Insights, and Brooklyn has been outperforming the rest of the nation in formation of quality restaurants and other new ventures. London startups are getting the same attention, with a 25 percent increase in the number of restaurants opened in 2012 compared with 2011. This sector offers flexibility in the ways that sales can be made - from food vans to dining clubs, pop-up restaurants to home online retail, or even simple market stalls. I have a suggestion for Matt's next product, an alcoholic adaptation called Tequila Tomato. Could be sold online in plastic bottles as a Bloody Mary Mix. 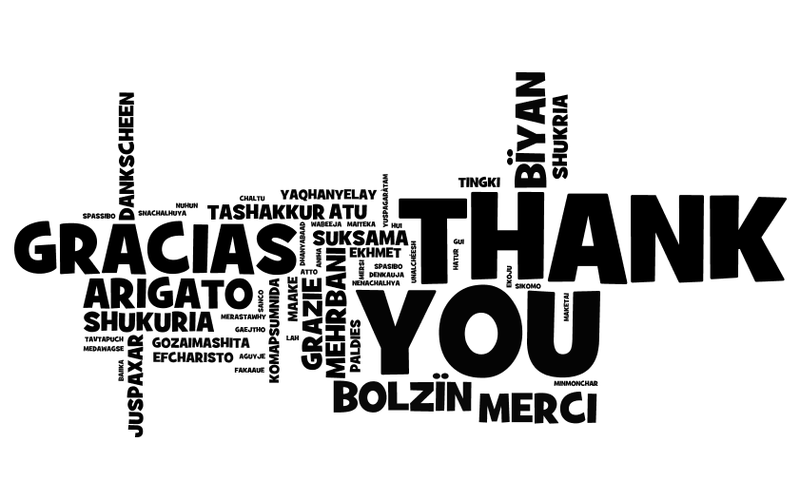 CityEconomist has had 100,000 page views since 2008–9,000 page views in August 2014. NYC Tax Amnesty: A Good Idea? 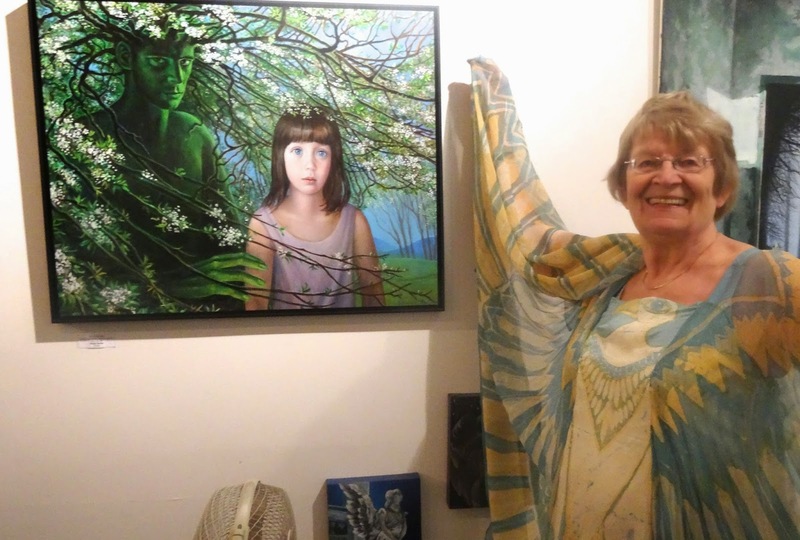 Brigid Marlin with her painting, "The Green Man,"
Imagination exhibit. All photos by JT Marlin. I had the pleasure on Saturday, Sept. 13, of visiting an exhibit at the Orange Art Gallery at 290 City Centre Avenue in Ottawa, Ontario. 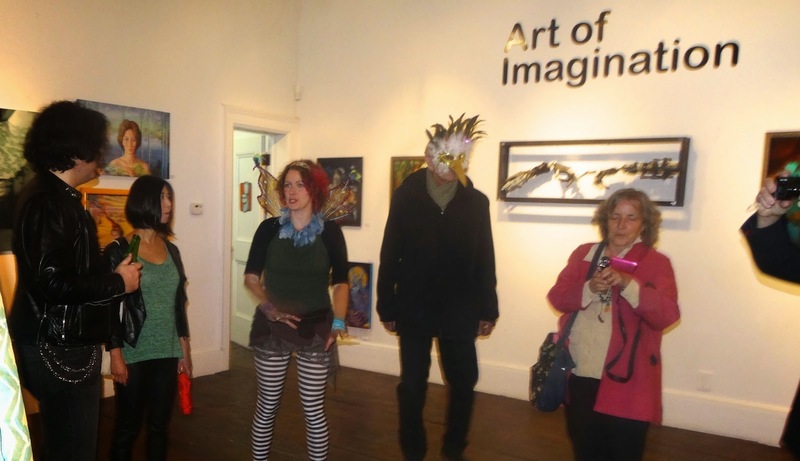 This was the last day of a ten-day exhibition with three venues and a faerie parade. The other two exhibits were at the Glebe Community Center Gallery and the Roast 'N Brew Coffee Shop. The gallery is on two floors. 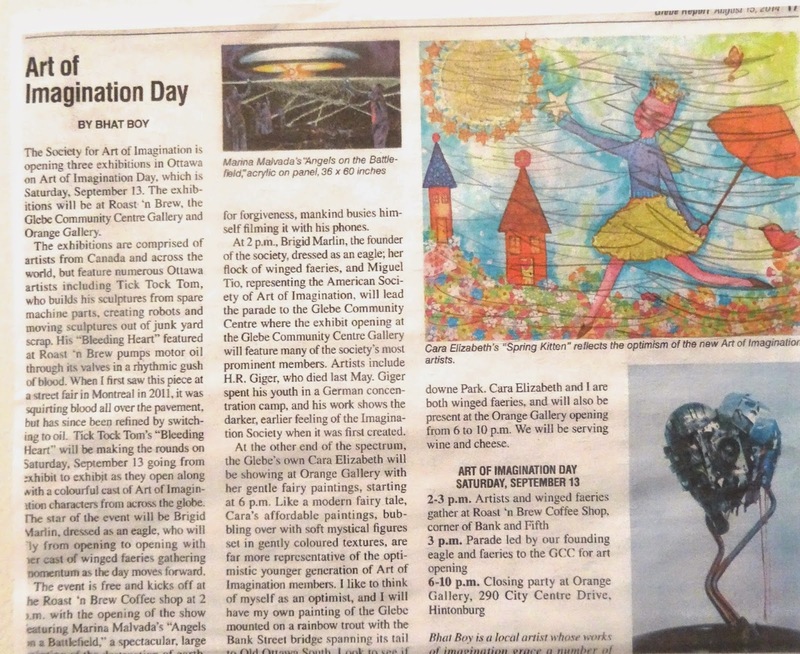 The exhibits and events were organized by the newly formed Canadian Chapter of the Society for Art of Imagination, part of an international association of more than 400 artists in 24 countries around the world. The Ottawa exhibit was organized by Bhat Boy, a successful local artist and art teacher. He started out drawing people's houses in Ottawa. He then went in for surrealistic pairings of royals or writers and politicos. He also does paintings that merge and mix buildings in his own rearrangements of urban landscapes. In his spare time, he has become well known in Ottawa as an advocate of better traffic control and of protecting local cultural institutions (like the Glebe Neighborhood Centre) from Ottawa City budget cuts. Some of those who came to look at the art. The events on the final day were well attended, especially given a day-long deluge of cold rain. Fall comes earlier to Ottawa than to New York City. The Orange Art Gallery on this occasion was targeting its art to a younger crowd, which is indeed where I have found the interest in fantastic realism – the focus of the Art of Imagination – to be strongest in New York City. A preponderance of the art is in the sub-$1,000 range, mostly $300-$900 per painting. 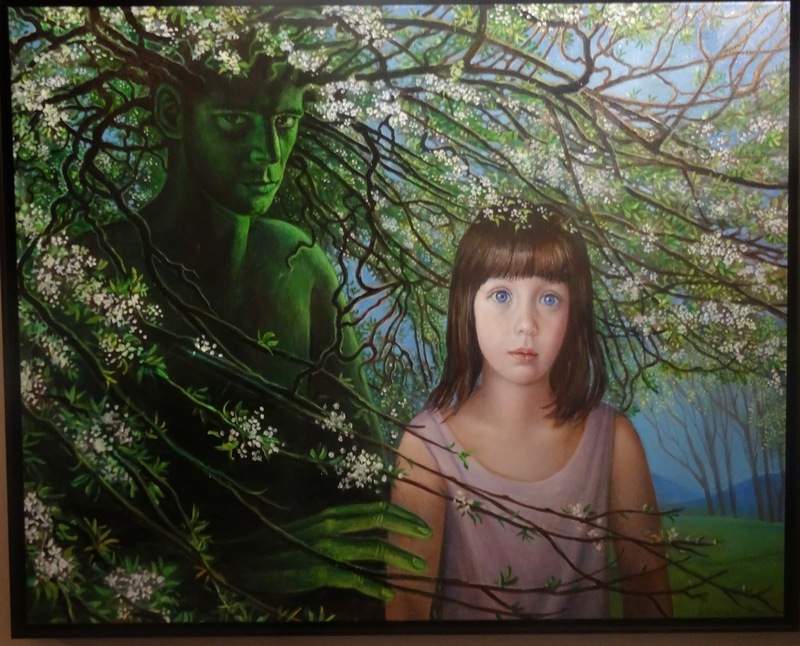 "The Green Man" protects (preys upon?) innocence. Much admired, this was priced at $7,500. Also shown in the large space were rooms with the gallery's regular artists. One such artist, Gwendolyn Best, paints all-black, red-eyed cats and bats and crows and rats on pastel backgrounds. It's all kind of cute. She has sold 700 of such paintings in the last year, mostly at the $300-$500 price point, although she has sold larger paintings for as much as $2,000. One of her paintings on display was of a Board of Directors of rats with one rat distinctly out of sync with the others. I was advised that this could well have been a representation of the painter's own experience dealing with a board. Some of the paintings in the show were priced at up to $7,500. However, only framed giclées of these higher-priced paintings were successfully sold, at $350 to $600 each. 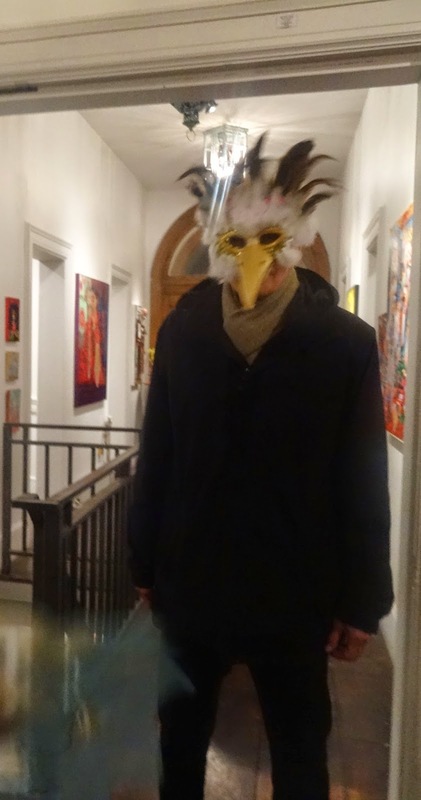 Judging by the mismatch between enthusiasm for the higher-priced items and the concentration of sales at a lower level during the closing party from 6 pm to 10 pm, the bull market for this kind of art in Ottawa – as in New York City! – seems to await the coming into money of a younger generation. The gallery itself is apparently doing well in a new and better location, in part because it is active in using the space for events, including weddings and other paying assemblies. The space used to be a bank to serve railway employees and users. It combines longer-term exhibits with special events and it has an artists' workshop in the lower level. I was especially taken by several lifelike foot-high sculptures by Maria Saracino - an Einstein-like man feeding birds, two people sitting at a Starbucks-branded table, and other characters sitting with a cleverly fabricated miniature newspaper on park benches. This artist is one of many artists tethered on a long-term basis to the gallery. Her sculptures sell well, for a minimum of $1,000. It is good to know that art markets are thriving in middle-sized cities like Ottawa. I found the same thing to be true in Vero Beach, Florida when I was there in March. - Artists who are local and sell paintings that have a style or a gimmick that identifies them (i.e., a "brand") and sell in the $350 to $600 range. - Visiting artists with paintings that sell at a higher price, mid to high four figures, who sold framed giclées also in the range of $350-$600. This sale of giclées is promising. The neologism dates back - from what I can determine from a quick bit of research - only to 1991. A giclée is simply a high-resolution print with long-lasting ink on canvas-like material. It is a good solution to the ongoing problem of reconciling gallery price points. A gallery knows that more sales will occur at lower prices, but the higher-priced art may suffer by being shown with lower-priced art. Cadillac showrooms don't sell Yugos or Kias at the same site. Similarly customers at Wal-Mart they are not likely to be in a frame of mind to buy on impulse an expensive Rolex. Putting a Rolex in with a less expensive Timex (a fine watch, I'm wearing one now) does not enhance the prestige of the Rolex, which prefers to be associated with pictures of up-market casinos and racetracks and yachts. The giclée offers an opportunity for the aspirational collector to participate in ownership of a more expensive artist at an affordable price. This is a good solution, but to protect the prices of the original art I believe that every giclée should be plainly marked. A viewer should not have to puzzle over whether a painting is an original or not, even though the idea is to make the copy as faithful as possible to the original. If the copy is really as good as the original it could cheapen the market for the original paintings. What do you think? September 7, 2014–Andrew F. Kay was born January 22, 1919 and died four days ago, on September 3. He was President and CEO of Kay Computers, a personal computer firm. He invented the Kaypro computer, which was once among a small handful of top contenders in the personal computer business. The only other facts in his astonishingly short eight-line Wiki entry miss the fascination of his story (in contrast with the Gary Kildall Wiki, which is long and interesting). Mr. Kay also served as Senior Business Advisor to Accelerated Composites, LLC. A 1940 graduate of MIT, he started his career with Bendix followed by two years at Jet Propulsion Laboratory. 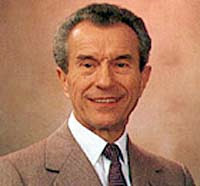 He later founded Non-Linear Systems, a manufacturer of digital instrumentation, in 1952. NLS developed a reputation for providing rugged durability in critical applications for everything from submarines to spacecraft. At NLS he invented the digital voltmeter. He was also a founder of the Rotary Club of Del Mar, California. As a member of the Board of Directors of Johnson O'Connor Research Institute, he pursued the advancement of education with particular attention to the development of "a thinking vocabulary" as a basic component of creating leadership capabilities for managers in science and technology fields. The lengthy and well-written obit in the New York Times by John Markoff does more justice to Kay's contributions, and tells the story of the Kaypro II, which like the Osborne 1, had for a couple of years the potential to take over the industry. The Osborne 1 was the star of the 1981 West Coast Computer Faire in California. The Kaypro II was the star of the 1982 Faire even though it weighed 5 pounds more. I owned both an Osborne 3 (still do) and a Kaypro II then and so did most of my friends. The Kaypro was all-metal, which made it impact-resistant but also heavy. It was nick-named "Darth Vader's lunch box". I lugged the lighter portable Osborne 3 computer and thousands of miles in a backpack in 1986, when Alice and I and our two children, 9 and 12, spent a summer in Japan courtesy of the Japan Foundation. Both the Osborne and the Kaypro could have won out, but they made classic mistakes, mostly in marketing, that opened the door for Microsoft to team up with IBM. Kaypro's Operating System, CP/M. Kaypro was based on CP/M (Control Program for Microcomputers), a computer operating system (OS) invented in 1973 by Seattle-born Gary Kildall, who had a Ph.D. in computer science from the University of Washington. An OS allocates storage, schedules tasks, and presents the boot-up and default interface to the user between applications (i.e., special programs for special needs). Early computers all had two disk drives so that the OS and app could be in one drive and the user's data in the other. A good OS makes it easy for third-party software writers to create apps for the computer. Kildall's CP/M allowed files to be read and written to and from an eight-inch floppy disk, the first disk operating system (DOS) for a microcomputer. If Andrew Kay had realized how valuable the OS could turn out to be, he might have pre-empted Microsoft by buying up the rights from Kildall and marketing them, keeping his Kaypro on track. Kay might have worked out a deal that made the Kaypro a real competitor with IBM. What happened instead was the consequence of the fateful outcome of an approach by IBM in 1980 to Bill Gates of Microsoft, to discuss the state of home computers and what Microsoft products could contribute. Gates gave IBM a few ideas on what would make a great home computer, including Basic written into the ROM chip. Microsoft had already produced several versions of Basic for different computer systems beginning with the Altair, so it would be easy enough for Microsoft to write a version for IBM. Writing an OS for an IBM computer would be a first for Microsoft, so Gates kindly suggested to IBM that it investigate buying the rights to CP/M from Gary Kildall, whose CP/M was now a standard OS, selling more than 600,000 copies. It was bundled with the Kaypro and other computers. IBM tried to contact Gary Kildall for a meeting. They got an appointment with Dorothy Kildall, Gary's wife and business partner since 1976, when the two of them formed a research and mail-order sales company, Intergalactic Digital Research (they later dropped Intergalactic from the name), to design and sell software for PCs. Kildall rewrote CP/M as BIOS (Basic Input/Output System) to make it compatible with different computers. By 1978, the company's product was the standard for most PCs and was generating $100,000 a month. In 1981, its popularity peaked but revenues continued to rise to $44.6 million in 1983. The legend, subsequently denied, is that Gary Kildall couldn't bother meeting with IBM, went flying instead, and Dorothy Kildall refused to sign a non-disclosure agreement. IBM walked away exasperated. The Wiki entry on Gary Kildall provides a pretty balanced picture of the Roshomon-like stories of what happened that day in 1980. Looking back at it, IBM's exasperation with Kildall and vice versa, if that's what it was, cost IBM billions of dollars in revenue and the Kildalls a bigger fortune and a bigger place in history (for what that's worth). There should be a name for that - the "Kildall effect". From the vantage point of today, that exasperation truly killed all for both sides of the negotiation. The beneficiary was someone not at the table, Bill Gates and Microsoft. Paterson's QDOS and Microsoft's MS-DOS. IBM returned to Bill Gates and gave Microsoft the contract to write a new operating system, which would become MS-DOS and would eventually end the use of CP/M and the Kaypro II. Microsoft developed The "Microsoft Disk Operating System" or MS-DOS. MS-DOS was based on QDOS, the "Quick and Dirty Operating System" written by Tim Paterson of Seattle Computer Products, for use on their fledgling Intel 8086-based computer. QDOS was a great name the cleverness of which has been insufficiently appreciated. 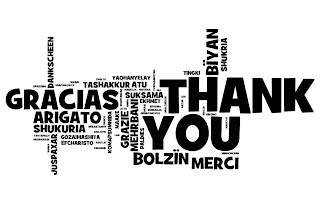 QDOS is pronounced the same way as the Greek word (κῦδος) for praise or fame, kudos (the Anglicized use of the word often incorrectly treats it as a plural of "kudo"). MS-DOS deep-sixed the great pun in the original at the same time as it eclipsed the fame of Kildall. Microsoft traded the pun for the marketing clout it borrowed from IBM. QDOS appears to have been reverse-engineered by Tim Paterson from Gary Kildall's CP/M. Tim Paterson purchased a CP/M manual and used it to write QDOS in only six weeks. QDOS could well have been different enough from CP/M to be a legally different product, but we will never know because IBM with its army of lawyers was not a great target for a law suit as central as that. In the end Gates (i.e., Microsoft) bought the rights to QDOS from Tim Paterson for only $50,000, keeping his mouth tightly shut about the request from IBM that Microsoft made write their PC-DOS. Bill Gates even persuaded IBM to allow Microsoft to sell/lease MS-DOS separately to other computer manufacturers. Virtually all of Microsoft's subsequent success comes from that one deal, which has been called the deal of the 20th century. Think of the markup - buying something for $50,000 and selling it to IBM for total revenue of about $1 trillion in average annual installments over the next 50 years of $20 billion. It's now 34 years since that deal and in the last two years, Microsoft revenue averaged about $80 billion. It's conservative to allocate only one-fourth of that revenue to the licenses that originate from its MS-DOS licenses. In 1981, Tim Paterson saw the light and quit Seattle Computer Products to go to work for Gates. The Aftermath–Kildall's Decline. 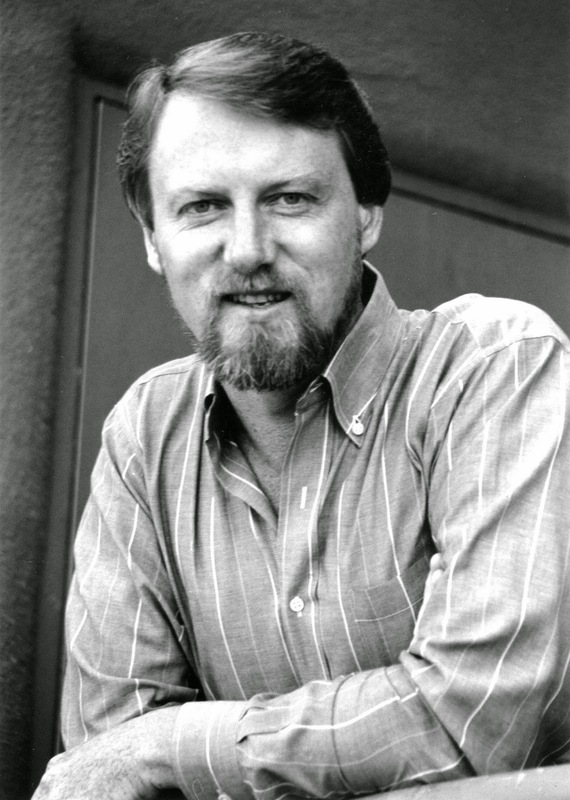 Gary Kildall, the inventor of CP/M, is the same age as me and died 20 years ago, the same year as my father. He made a deal with IBM that he decided was administered unfairly. He lashed out at Microsoft as MS-DOS took off and he was personally convinced it was copied from CP/M code. He and his wife Dorothy were divorced in 1983. He remarried in 1986 and five years later gave up control of his company. He started to have problems with alcohol and took up hanging around with other motorcyclists, a deadly combination as he reportedly died in an assault in a bikers' bar. The decline of his company and the inevitable comparisons with Bill Gates and Microsoft were hard for him to take. But he sold his company to Novell in 1991 for a reported $120 million so he made out better financially than Osborne. After his death he was given many generous recognitions, including praise from Bill Gates, who–to be fair– did not start competing with Kildall until after IBM was rebuffed (if that is the right word). 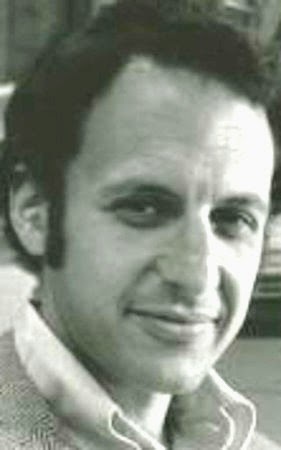 Today's New York Times has a four-column obituary of Michael B. Katz, Harvard '61, Ph.D. '66, Walter H. Annenberg Professor of History at the University of Pennsylvania, who died on August 23 in Philadelphia. It is worth reading. It recognizes a long life spent on the topic of poverty, which recently has regained mainstream interest because of U.S. and global trends toward greater inequality. The obit by Paul Vitello identifies succinctly the core questions about poverty that Katz addressed in his histories of how America has treated its poor people. Katz was a Penn history professor for 36 years and founded its urban studies program. Less than one year ago, he wrote in The New York Times about NYC Mayor Michael Bloomberg's antipoverty record, suggesting that it was significant and insufficiently recognized. The two best-known books by Prof. Katz were "In the Shadow of the Poorhouse" and "The Undeserving Poor". His history of poverty programs extends from the poorhouses modeled on England's, to the Progressive Era reforms, to a Freudian analysis of poverty in the 1920s and FDR's New Deal. Katz contrasted the microeconomic idea that as economic agents we are masters of the marketplace - and therefore the poor must be defective or "undeserving" in some way - with the macroeconomic idea that the poor remain poor because rich people who control the rules of the economic game make sure the game is rigged in their favor. Katz chronicled the ways in which prejudice in the workplace, in lending practices, in housing, in business location and in the political process kept the poor in their place. The thrust of his published work was to question the idea that there is an "underclass" and a "culture of poverty" that is beyond the help of public policy. He asked whether public policy might not be a major source of the problem. No breakout in job creation. Nonfarm payroll jobs increased by 142K in August, a break in a six-month series of 200K+ job increases, the BLS has just reported. The predictions were for a 220-230K increase. Both the August unemployment rate of 6.1 percent and the number of unemployed persons, 9.6 million, were little changed from July. 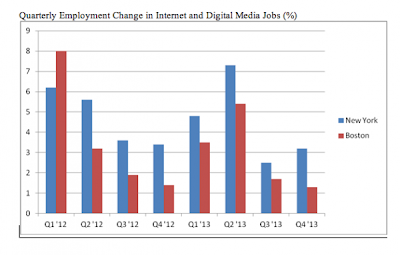 Some commentators were hoping for a 6.0 percent unemployment rate, or even sub-6.0 percent. The August unemployment rate was down by 1.1 percentage points from August 2013. The number of unemployed persons was reduced by 1.7 million from August 2013. As I said earlier this week, the post-Labor Day employment figures will reflect the back-to-work scene better, as well as the net effect of educational hiring. The Fed meanwhile gets no encouragement to hike interest rates quickly. Eyes will be on the next release on October 3. October 3 - The September job numbers - more reliable than August because the dust settles in the educational arena - were revised upward for both July and August, narrowing the gap between the predictions and the BLS-reported numbers. The BLS report for September also showed the unemployment rate down to 5.9 percent, in line with some predictions for the August numbers. The BLS seems to be catching up to the forecasters. I just got a message with the August bill from an electricity provider who adds extensive advice on how to save money on air conditioning. 1. Why now? Because now is when people pay attention to saving money on A/C, because they have gotten their August electric bills. 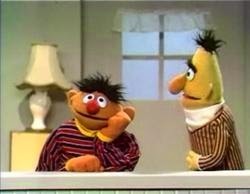 When my children were much younger, I had the pleasure of watching a Sesame Street episode (#0344) in which Bert complains to Ernie: "The apartment is wet. The rain is coming through the window." Ernie responds: "The window is stuck. I have to go outside to fix it. But it's wet outside. Later." Then the rain stops, the sun comes out. Bert complains again: "Can you fix the window now?" And Ernie responds: "Why Bert? There is no rain coming through the window. What's to fix?" 2. Another possible reason we get the advice in September is that the electricity provider doesn't want us to blame them for the high August bill. 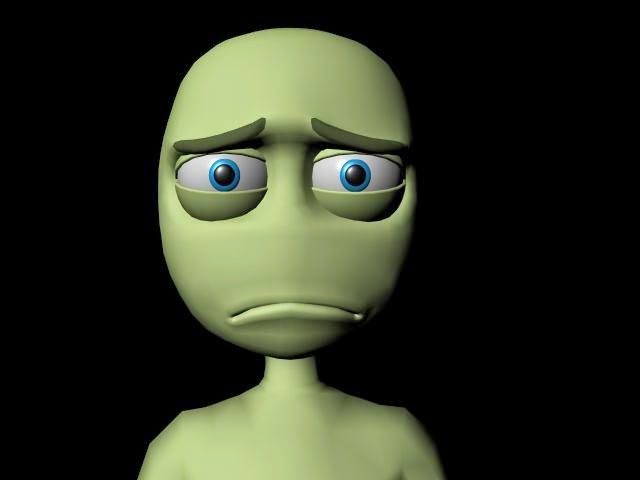 Giving us advice shifts the burden to us. Set the A/C Fan Switch to Auto. Choosing the “auto” setting causes the fan to shut off when the desired maximum temperature on your thermostat is reached. If the A/C cycles off 60 percent of the time, turning the fan switch to “on” will make the fan run more than 400 extra hours a month, which can cost $16 or more for a single-room A/C unit. A fan given a rest will last longer, and the system will dehumidify more efficiently if moisture is given time to drip from the cold cooling coils into a condensation pan and drain outside. Set Your A/C Thermostat at 78 degrees or Higher. With each degree higher that you set your A/C temperature, you will save between 1% and 5% on your electric bill, depending on the utility company and what else you plug in. Raise the Thermostat Temperature When You Leave. If no one is home, raise the maximum temperature to, say, 82 degrees during the day. If you normally have it at 78, you’ve saved at least 4 percent of the cooling cost during the time you were gone. Programmable thermostats make this a routine and they may be subsidized through your utility. Install Ceiling Fans. Ceiling fans circulate cool air downward and can make a room feel up to 10 degrees cooler. Ceiling fans can save up to 25 percent on the energy bill if used to cool down rooms instead of lowering the A/C thermostat setting. Pull Down the Blinds on Windows Getting Sun. Indoor lighting requires much less energy than extra A/C usage. Cover your windows when the sun hits them during the day. Blinds and curtains are a good investment. Our ancestors knew. Use the Delay Setting on the Dishwasher. Have the dishes washed when the sun is down and the heat that is generated doesn't add to A/C use. Use the barbeque outside instead of cooking indoors to keep the kitchen cooler. Install Solar Panels. With subsidies and tax breaks, solar energy panels can pay for themselves in five years, which implies simple-interest return of 20 percent a year. Better than banks are paying! Solar panels generate the most electricity when it is most needed for A/C. Energy-Efficient Products and Homes: the Federal EPA Energy Star website. Renewable Energy for the Home: A starting point for looking at solar, wind turbines, home hydropower. 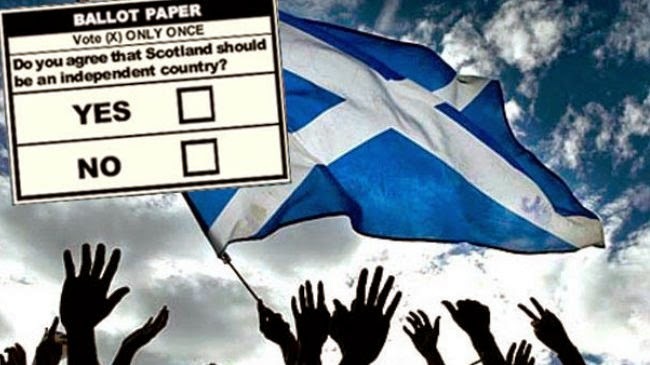 Scotland votes yes or no on Independence on September 18. The U.S. dog in this fight is economic. Scottish influence on the United States has been huge from the birth of the USA. The American Constitution is based on that of the Scottish Presbyterian Church. At least one-third of the signers of the Declaration of Independence were of Scottish origin. Scottish influence on American politics are mixed. They have both yin (unification for economic purposes) and yang (independent Scotland first, unconquered) elements. The "Yes" for independence campaign taps into the yang of the Battle of Bannockburn and the Good Sir James Douglas and the chasing of British troops back to Yorkshire. It taps into "Braveheart" Wallace and the Declaration of Arbroath, which inspired the American version. The "No" campaign taps into the yin of economic growth, of open markets. J.K. Rowling, a beneficiary of open trade and free movement between England and Scotland, has contributed substantially to the anti-independence, "Better Together" campaign. The root of the first three letters of economic is the Greek word for home (οἶκος, oikos). It looks now as though the vote will be closer than expected one month ago. The pro-independence yang ("Yes") vote has been growing. Its emotional appeal is strong. Despite the seeming momentum of yang in the polls, I expect that yin ("No") will win. 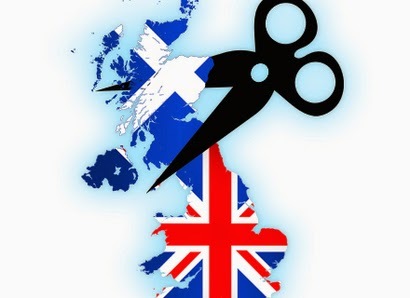 Scotland's nomenklatura does not want to risk losing markets by voting "Yes". I think that is also the sensible vote. Save the macho stuff for the gym and the Highland Games. After I posted the above I read the New York Times editorial on the subject. The Times does not take a position on the yes or no case, but notes that it is more than an economic issue. It concludes, based on what both sides are saying to the swing voters, that voting either way will have limited consequences. I'm not so sure the consequences will be so limited. The main position of the Times is that the votes in Scotland and Catalonia are possible only because of the European Union, and isn't it wonderful that Scotland has a chance to vote on this instead of having to defend one's independence by fighting (as in Scotland under Edward I and II, and in Ukraine today). Update, September 7 - A poll shows the "yes" vote has pulled ahead, although by a statistically insignificant margin. In other words, it is a toss-up. Yin or yang? 1. When is the 2014 primary in New York State? It is on Tuesday, September 9. Candidates for state offices will be voted on, including Governor and Lt. Governor. The general election will be on November 4. 2. Who can vote in the primary? 3. Can a voter with two homes (owned or rented) be registered to vote in two locations? No. A voter may vote in only one location in an election cycle. 4. Does registering at the address of a vacation home change the location of someone's "residence" for tax purposes? No. New York State Law allows second homeowners to choose where they want to vote - either their first or their second home. Someone with a home in New York City and a home on the East End of Long Island may register and vote on the East End even if New York City is the person's primary residence. However, there must be a continuing connection with the East End residence. 5. 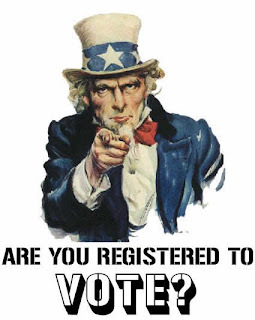 How do I register to vote in November? 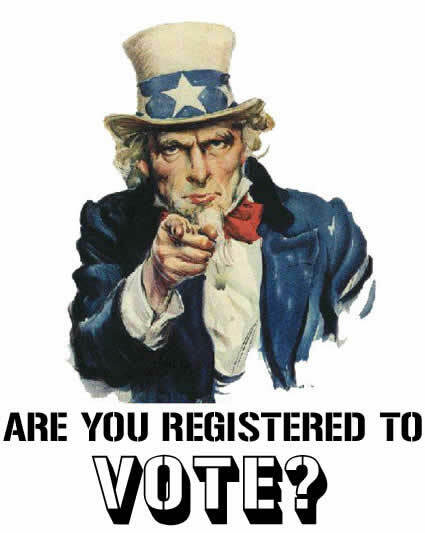 To vote in the general election, register. Pick up a voter registration form at the Post Office, fill it out and mail it in before the deadline (in 2013 it was October 10). To change your registration address from New York City, make sure that you include your current voting address in Box 10 of the registration form, so that registration from the NYC address is cancelled. 6. I won't be near my local voting address in November. Can I cast an absentee ballot? Yes. Pick up a request application for an absentee ballot form at the Post Office and fill it out immediately; the deadline for submission of the application will be at the end of October (in 2013 it was October 29) . If you are registering to vote and need an absentee ballot application, the voter registration form is one-stop shopping, because it provides an opportunity to apply for the application in Box 14. 7. What Offices are on the ballot? 8. What Ballot Proposals are voted on? In addition to voting for candidates, New Yorkers vote on whether to amend specific provisions of the New York State Constitution via referenda, also known as ballot proposals. The NYS legislature (both the State Senate and Assembly) must vote on the proposals' appearing on the ballot two years in a row. Then, the NYS Board of Elections must certify the language of the proposals - and their abstracts, or official summaries - by early August, 3 months before the General Election. Chart of BLS data on non-farm payroll jobs since 2008 by Dan Diamond. Friday's BLS report on August jobs is expected to come in at another increase of approximately 220K jobs. This would be the 7th month of 200K+ job increases. The jobs increase has dropped the unemployment rate by 1.1 percentage points, to 6.2 percent in July. The next month, October 3, jobs report may be more significant as post-Labor-Day hiring will be reflected. 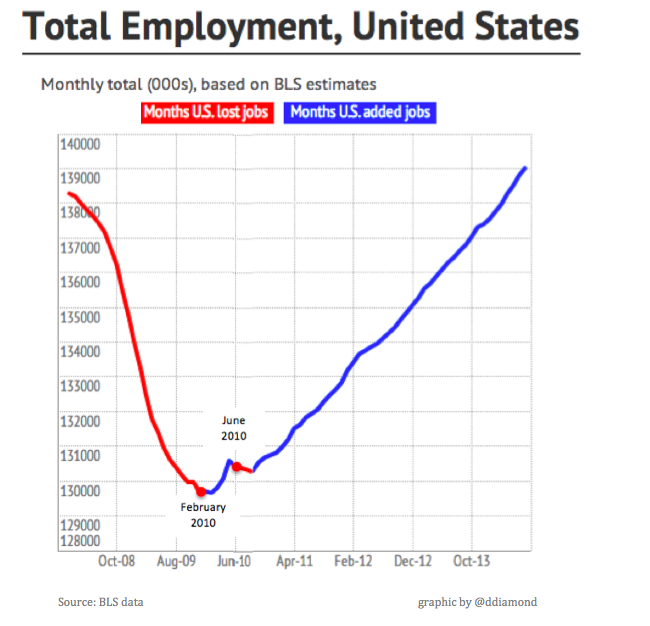 As the chart at left shows, the United States has gained 9.2 million jobs since the low point of the recession in 2010. As of the last BLS report, total non-farm U.S. payroll jobs exceeded 139 million. JOBS | NYC Tech Firms Top Growth List–"Inc. 5000"
Every year the New York City-based Inc. Magazine ranks the fastest-growing 5000 U.S. companies. The latest list for 2014 was recently released. NYC ranks #1 for 2014, claiming 204 (4.1 percent) of the Inc. 5000 companies. The NYC metro area also ranks #1 for 2014, with 399 (8 percent) of the Inc. 5000 companies. 1. Centric Digital, 69x revenue growth since 2011. Manhattan, Flatiron District. 2. Revi Media, 58x. Manhattan, Tribeca. 3. Adore Me, 55x. Manhattan, Fashion District. 4. Crowdtap, 52x. Manhattan, NoHo. 5. Tough Mudder, 47x. Brooklyn. 6. Regal Wings, 41x. Brooklyn. 8. Global Energy Efficiency, 36x. Bronx. 9. Integral Ad Science, 32x. Manhattan, Union Sq. 10. SeatGeek, 30x. Manhattan, Union Sq. We signed up to speak at the Hearing in East Hampton that started at 5 pm, but were not able to wait beyond 8 pm. We sent the following comments to the Secretary of the NY State Department of Public Services. Respect for local environmental and land use provisions. These omissions are especially serious in light of PSEG's record during the past year in expanding the electricity-transmission capacity of New Jersey and Long Island, NY. It does not seem to have given any weight in this task to local rights, regulations or responsibilities, and the risks to safety that its expansion creates. Installed super-tall poles (70 feet long, says the NY Times), widely viewed as eyesores, that have been treated with a toxic chemical, Penta or PCP (Pentachlorophenol) an organochlorine compound primarily used for preservation of wooden utility poles. There are no permissible residential uses. The manufacturer says it may be fatal if inhaled or absorbed through skin, harmful if swallowed, and irritating to skin, eye and respiratory tract. It can cause cardiovascular and other effects. PSEG workers who put in the poles are exposed to Penta through inhalation and skin contact. Residents are exposed through contact with ground around the wood, or drinking water contaminated by Penta through leakage into wells. U.S. EPA classifies Penta as a "probable carcinogen". Has proscribed local first responders from removing fallen wires, which run in front of the Emergency Services Building in East Hampton. This may halt the ability of local first responders to reach victims in emergencies, with the possibility of long delays in providing emergency services in hurricanes and storms. Herewith a few notes about three communities from the growing recent record of insults to community planning and regulations - Ridgewood, NJ; Port Washington, NY; and East Hampton, NY. Ridgewood's Mayor went to the NJ Board of Public Utilities (NJ BPU) in Trenton to stop the taller, higher-voltage utility poles. He noted that PSEG did not provide advance notice, was using higher-voltage lines without regard to the increased hazards in an emergency, and the poles would lower property values in a community where the median home price exceeds $700,000. The increasing frequency of destructive storms combined with the increasing demand for electricity suggests that the 'business-as-usual' approach — more poles with higher voltage — must be revisited. Board of Public Utilities President Hanna observed that during Hurricane Sandy and other storms, NJ utilities had already been criticized for failure to update customers about mass outages. BPU noted that PSEG never secured required road permits from the Village of Ridgewood. We’re not talking about rocket science here. You can short-circuit a lot of problems by communicating ... to the municipality and to the individuals who are going to be directly affected. This experience has reinforced to us the importance of communications with the communities in which we are building and upgrading facilities. We ... will continue to look at ways to improve the process to better assure that communities understand the rationale for projects and to allay any health and safety concerns in advance. We want to protect the identity of the town. The town should look good, and not ugly like this. I’m petrified of this huge pole more than being without electricity. David Daly, PSEG-Long Island's president and CEO, told Port Washington that "There is no option to stop the project," and that the lines could be buried later, but the cost of millions more would be passed on to customers, "as long as you want to pay for it." Utilities can "do what they want", said Gerald A. Norlander of New York’s Utility Project, a consumer group. However, he said, the NY State Department of Public Service can place limits on them. As a result of community opposition, Governor Andrew Cuomo's office has asked the Department of Public Service to review the PSEG-Long Island project. Judi Bosworth, the supervisor of the Town of North Hempstead, which includes the project route, wonders whether Hurricane Sandy recovery funds could be used: "It seems to me that burying the wires is something that could qualify, and we plan to make a strong case for that." Michael Meenan of the Federal Emergency Management Agency said hurricane money could be available if burying the lines would reduce the likelihood of future damage and was cost-efficient. East Hampton, April 2014. In January, PSEG began installing 267 of the 70-foot-long utility poles to cover six-and-a-half miles of transmission from East Hampton Village to Amagansett. The project halted in April when East Hampton Town issued a stop-work order at the Amagansett substation. PSEG failed to obtain site-plan approval or a building permit. PSEG filed a temporary restraining order, which was denied. It also filed for a permanent injunction against the town - decision still awaited at the State Supreme Court’s Appellate Division in Brooklyn. We wanted to be involved in the energy-alternative process, and not be handed a fait accompli. ... There could have been a better job of presenting this to the public for discussion, and perhaps alternatives could have worked out in advance of this happening. Some Southampton customers have not paid the extra charge and PSEG has sued Southampton Town for the $200,000 in allegedly unpaid charges. East Hampton residents, such as Debra Foster, have organized a "Save East Hampton" group around the “Bury the Lines” issue. We attended the hearing because of her work bringing it to our attention. Her groups entirely right that the Utility 2.0 Plan does not incorporate the promise made by PSEG after the BPU reprimand in 2013. It should do so and PSEG should respect the promise. This is not our first rodeo. We were at the 820 mW Shoreham plant in the 1980s, protesting the folly of nuclear power in an area where there was no safe escape route in the event of an emergency and no safe exit for nuclear waste. The venerable Long Island Lighting Company (LILCO) was founded in 1911 by Ellis Phillips, an engineer. LILCO spent 20 years building the Shoreham Nuclear Power Plant, but never gave enough credence to community opposition. Ultimately, public pressure brought Shoreham and LILCO to an end in 1989, under Governor Mario Cuomo. The $5.5 billion plant was eventually dismantled before it ever operated. So it should not be an impossible dream for East Hampton residents to take down all of the 267 poles and bury the lines. The problem is that LIPA and the Governor make environmental commitments to customers that PSEG then mocks. East Hampton has been celebrated in the Governor's Comprehensive Energy Vision as a leader in Renewable Energy and Energy Efficiency. The Town should be treated like a leader. PSEG's Utility 2.0 plan seems to be moving PSEG toward building seven new fossil-fuel power plants on Eastern Long Island, is inconsistent with decisions by local residents. East Hampton has pledged itself to be 100 percent independent of fossil fuel by 2020, and 100 percent dependent instead on renewable energy - solar, wind, geothermal, batteries. Utility 2.0 should be redesigned to be consistent with East Hampton Town's own plans. We urge FEMA to finance the removal of the poles and burial of the transmission wires, and we ask PSEG and the Town and other levels of government to participate in a joint effort to increase public safety and save East Hampton by burying electric, telephone and cable wires.